When you are planning your Halloween decoration motif, what is the first thing that comes to mind? Besides that fog machine you bought and break out every chance you get. Right, pumpkins! Pumpkins and jack-o-lanterns are practically the official symbol of the holiday. Luckily, there are a lot different things that you can do with them, so your decoration designs will stay fresh long after the pumpkins no longer are! 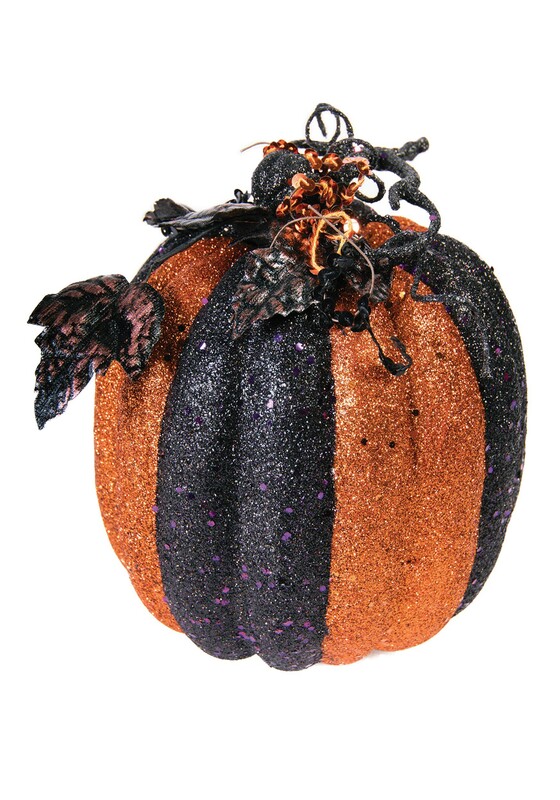 Speaking of fresh pumpkins, if you're looking for a new decoration that won't get funky and melt into your front porch after a couple weeks, these Orange & Black Striped Glitter Pumpkins make a great alternative to real pumpkins. These faux-gourds are made of hard, lightweight foam, and are covered in glitter. They look great indoors and outdoors, and can sparkle by themselves or as part of a bigger set of decorations. They can also be used year after year! And yes, they even look good when used with your fog machine.